I love to find new authors who write Christian fiction. It’s so exciting to discover a gem you didn’t know existed, one that makes you stay up well past your bedtime because you can’t put their book down. Last month, I started one of Linda J. White’s books and I couldn’t put it down. 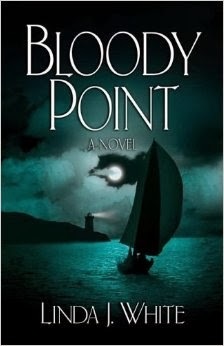 I had the opportunity to meet this author at a conference this year, and purchased Bloody Point at a book signing. When I turned to the first page of Linda’s book I couldn’t wait to delve into the work of someone I’d met. I love suspense, and this novel was in that category. From the first page, I knew I wasn’t getting any sleep that night. I’m a night owl by nature, so it was no surprise to me that the fast pace of this storyline was going to keep me up. Right away, I liked the characters and cared what happened to them. To my writing friends, we all know how important it is that our characters are likeable. I was intriqued by the back story to Cassie McKenna, the main character. The detail Linda used to show the community at marinas and life aboard a ship was new to me. I had no before hand knowledge, yet she made it all so easy to imagine. And the insight into FBI protocol and work was also intriguing and very realistic. This fast-paced novel won five out of five stars with me. If you haven’t had an opportunity to read any of her books, it’s well worth your time. Thanks Renee. I hope your future published book is in one of my reviews some day. Thank you for the nice review, Erin! I'm so grateful for the opportunity. My husband (the sailor) would be so pleased you felt like the book immersed you into the sailing world! What's your newest published book? I'd like to get it. Erin! Linda White's newest novel is the fabulous Seeds of Evidence. Is that the one about human trafficking or is it a different one? Thanks for checking out the review!